load a really big image into our game. it's what's called a tile sheet! create a tile engine with kontra, so we can parse our tile sheet. the purpose of the tile engine is to split up a big image (like the one we loaded up in the step above) into individual tiles that we can paint onto our game board. this will let us create whatever kind of game board we want. 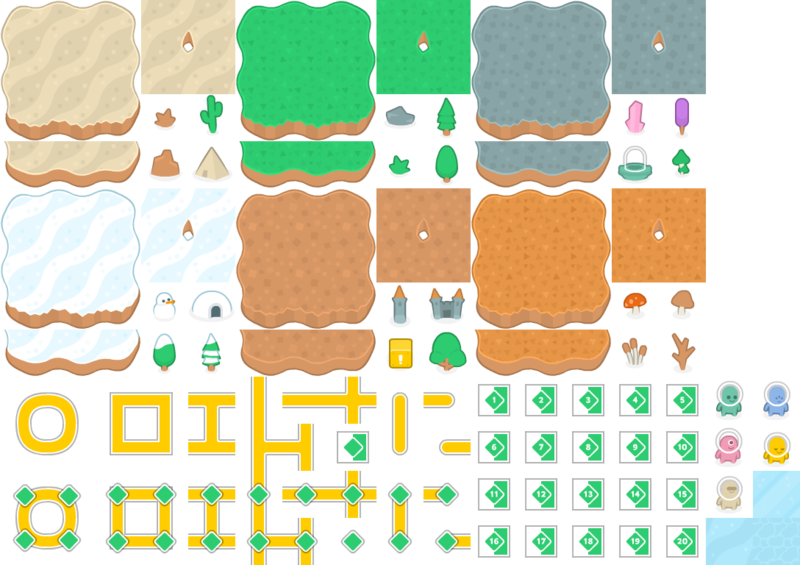 use all water tiles for the first layer in the tile engine and use a bunch of earth-type tiles for the second layer. leave some tiles in the earth layer transparent by setting them equal to the number 0, so it looks like our character is on an island! create a sprite sheet from this image. the purpose of the sprite sheet is to split up an image we give it into multiple frames, so we can animate through these frames and make it look like our character is walking. since we're using a few values in multiple places, we're going to assign them to variables and use the variables instead. this way, the code becomes more readable and if we want to change an option we can change it in once place.